Directeur de Collection : Perez Pedro J. 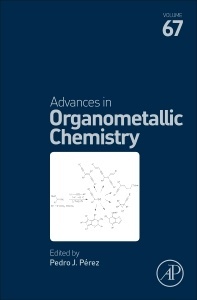 Advances in Organometallic Chemistry, Volume 67 contains authoritative review articles of worldwide known researchers on the field of organometallic chemistry, covering topics in organometallic synthesis, reactions, mechanisms, homogeneous catalysis, and more. Updates in this new volume include chapters on Group 6 Metal Fischer Carbene Complexes: Versatile Synthetic Building Blocks, Recent Advances in Transition-Metal-Catalyzed Cross-Coupling Reactions With Tosylhydrazones,Oxidative Functionalization of Late Transition Metal-Carbon Bond, and Biaryl Synthesis via C-H Bond Activation: Strategies and Methods. This book will benefit a wide range of researchers involved in organometallic chemistry, including those working on synthetic protocols, mechanistic studies and practical applications. Researchers involved in Organometallic Chemistry from a wide perspective, including synthetic protocols, mechanistic studies and practical applications and to those involved in the use of organometallic complexes in homogeneous catalysis.